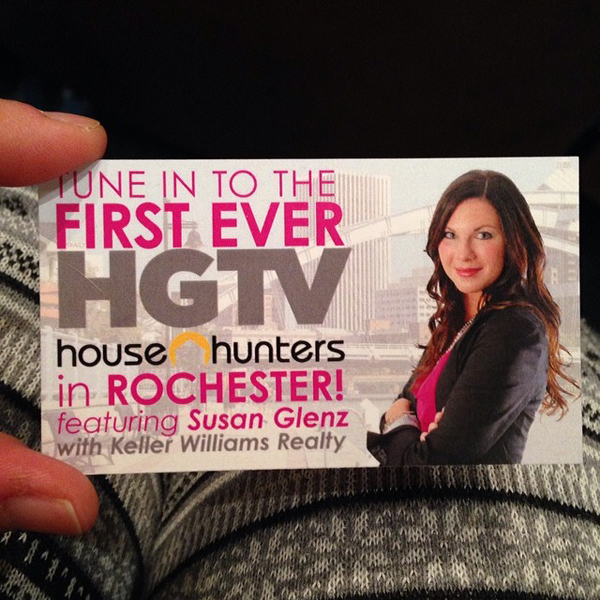 I thought I already had a long day of meetings, a yoga class, a violin lesson and an animal shelter volunteer meeting before I even knew I was invited to attend the viewing party for the Rochester edition of HGTV House Hunters. For the first time, House Hunters came to Rochester, to follow Mike and Danielle and their Keller Williams Realtor, Susan Glenz, as they looked at three potential new homes. I was so glad I went! I love looking at houses, and I love seeing Rochester on TV. It was a great episode with a cute and funny couple. Oh and an adorable dog named Sophie who put her request in for a house with a big fenced in backyard. I don't think I will ever look at glass cupboards and deep sinks the same ever again!